BS Mobile is one of the few local brands that managed to keep breathing despite of heavy competitions, both from bigger Filipino makers as well as from foreign entities. 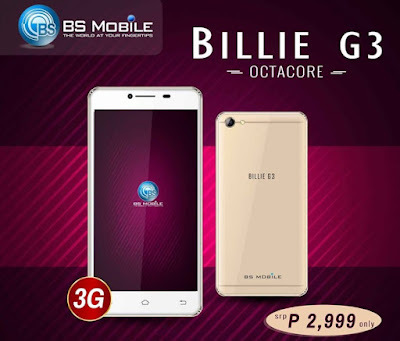 The company recently celebrated its 4th year anniversary, and it seems that they will continue to strive the stiff and fierce opponents with their latest device, the Billie G3. The BS Mobile Billie G3 sports a 5.5-inch capacitive touchsceen display powered by a 1.5GHz octa core processor of unknown chipset paired with 8GB of internal storage and 1GB of RAM. This dual SIM handset comes with an 8MP main shooter with flash and a 5MP selfie snapper. The other details include, 3G connectivity, expandable storage and runs on slightly ageing Android Lollipop. If I am not mistaken (please correct me if I do), the Billie G3 is their first ever octa core smartphone, and surprisingly, they are able to priced it well, well enough for under 3K or Php2,999 to be exact. Specs wise, there is nothing to blow your mind, but with its asking price, it surely is deserves a commendation.